For me, the highlight of my visit to Seattle was the Pike Place Markets. We spent a substantial amount of time there exploring and eating during our two days in Seattle. There are a lot of stands selling cooked food, but its big draw card must surely be the fresh produce on offer. 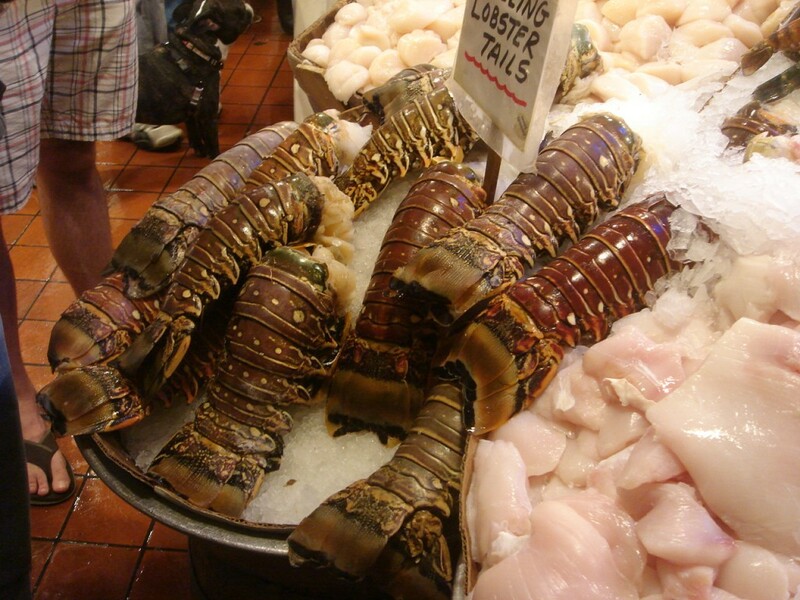 Jumbo prawns and king-kong sized lobster tails that were as fat as my leg (I kid you not) had my mouth watering. If I were to ever go to Seattle again, I’d like to stay in a furnished apartment with a kitchen instead of a hotel so that I could shop, cook and eat my little heart out! But seeing as we had no kitchen, the next best option was to head out and sample Seattle’s culinary scene. Research on Zagats and local blogs suggested that Restaurant Zoe was one of Seattle’s finest. More of a bistro than a fine dining venue, the restaurant is simply decorated throughout in dark wood. For our amuse bouche, we were presented with some foie gras parfait crostini with date puree. The parfait was too salty and killed off the flavour of the foie gras. The bread was a homemade focaccia which was soft and well seasoned. The crust wasn’t particularly crispy, but the bread was tasty nonetheless. The menu is divided between salads, small plates, and fish and meat. From the salads we chose the Dungeness crab ($15.50), a type of crab that is typically found on the west coast of North America. The generous serving of crab meat – all white – was lightly dressed, allowing the natural sweetness of its flesh to sing. 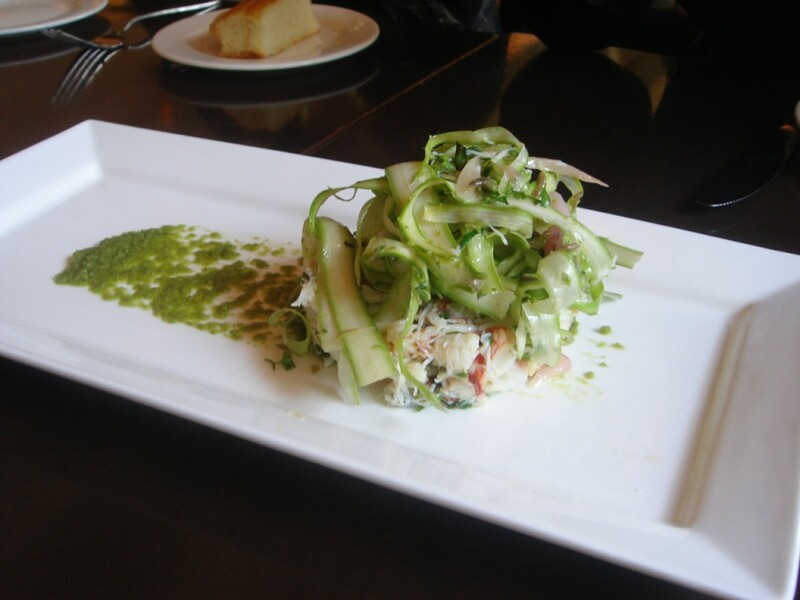 The crab was accompanied by brioche croutons, slivers of green asparagus and some scallion puree. The delicate flavours of these ingredients worked well with the crab. This dish was lovely. From the small plates we had the beef tongue with semolina gnocchi and braised morels ($14). 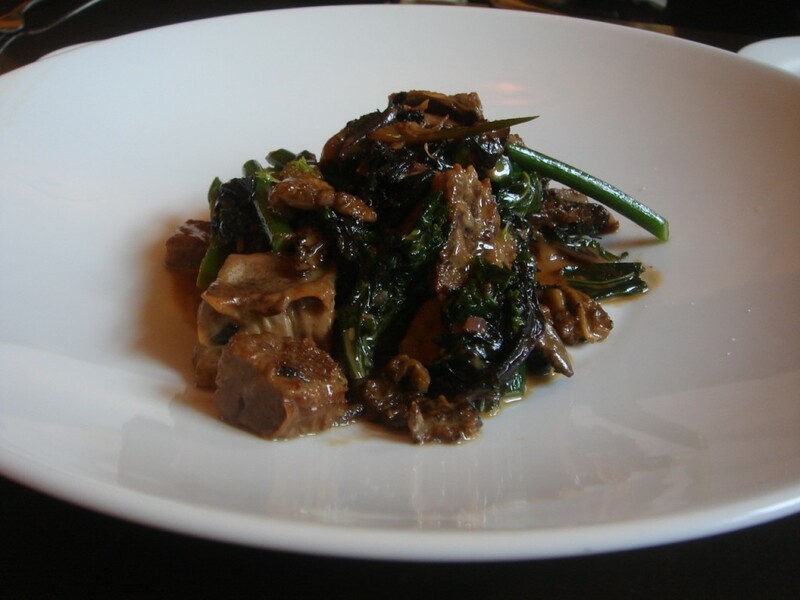 The beef tongue was wonderfully tender and flavoursome, and it married beautifully with the accompanying morels, wilted greens and mascarpone. Some lemon helped to cut the richness of this dish. The gnocchi were not the traditional small pieces of gnocchi as we know it, but a mixture of potato and semolina shaped like a cake, and then pan-fried to form the base of this dish. The gnocchi ‘cake’ was light and airy, and all the elements of this dish tasted wonderful together. Its only drawback was that it was a bit cold. Another small plate of fresh ricotta gnudi ($9.75) was less successful. 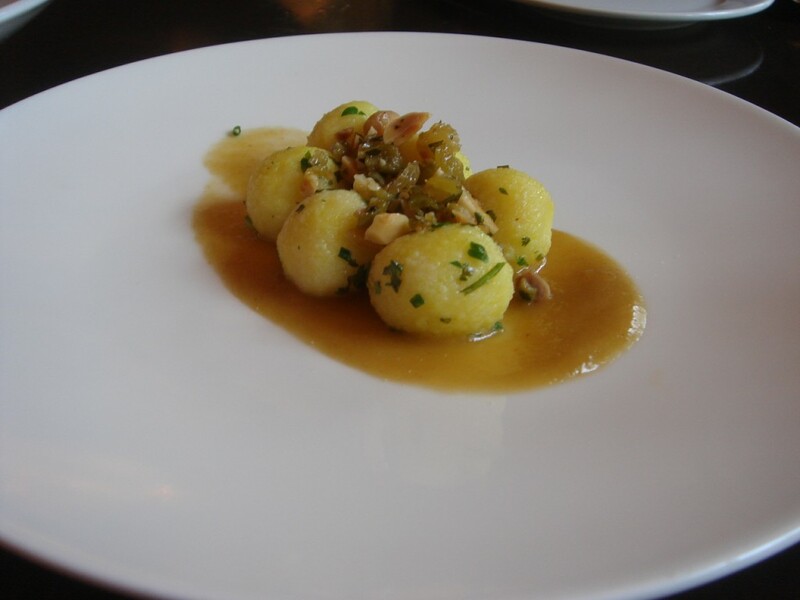 Gnudi is a cousin of the gnocchi which uses ricotta instead of potato. Its texture was a little dense and overall this dish disappointed. The golden raisin puree in the accompanying sauce made the dish far too sweet. Also in the sauce were some picholine olives for a touch of saltiness, curry oil for some spiciness, and almonds for crunchiness. The combination of all these ingredients created more of an oddity rather than a balanced dish. 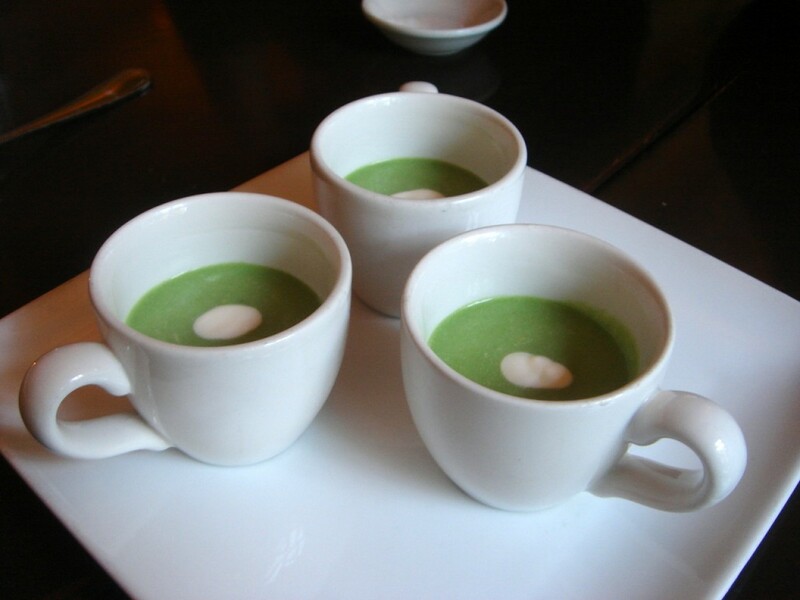 As a pre-main, we were presented with a chilled asparagus soup with creme fraiche, which with its rich asparagus flavour, bore all the trademarks of a good summer soup. Alaskan halibut ($30) was our fish choice. 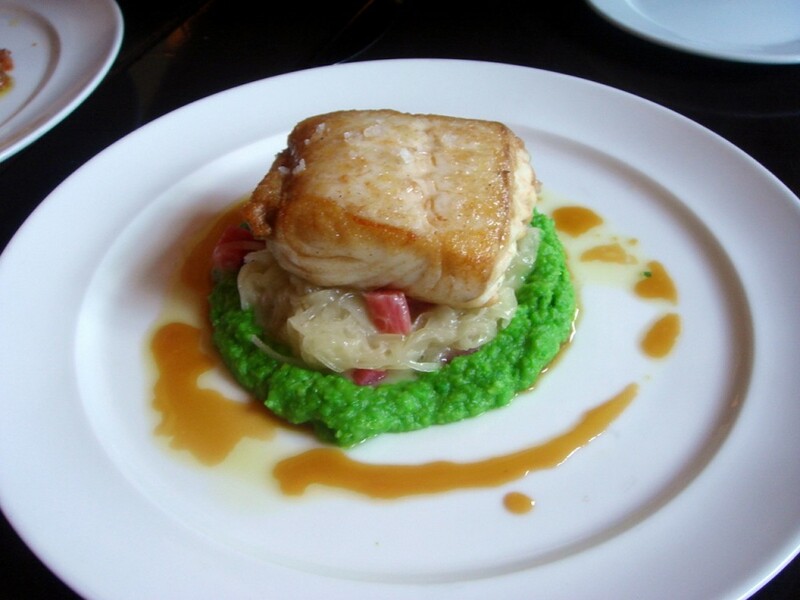 A beautifully piece of crispy moist fish, it was served with an onion soubise, English pea fourchette (mashed peas), and rhubarb. Each of these individual components were wonderfully cooked. The onions, not so much a soubise (a béchamel based sauce) as caramelised onions, were soft and sweet, and the peas were fresh and summery. But as a complete dish, there was a little too much of the very tart rhubarb, and a little too much of the sweet onion. The flesh of the halibut was quite delicate in flavour, and it wasn’t strong enough to hold up to the amount of tartness and sweetness on the plate. A bit more balance, and this dish could have been wonderful. 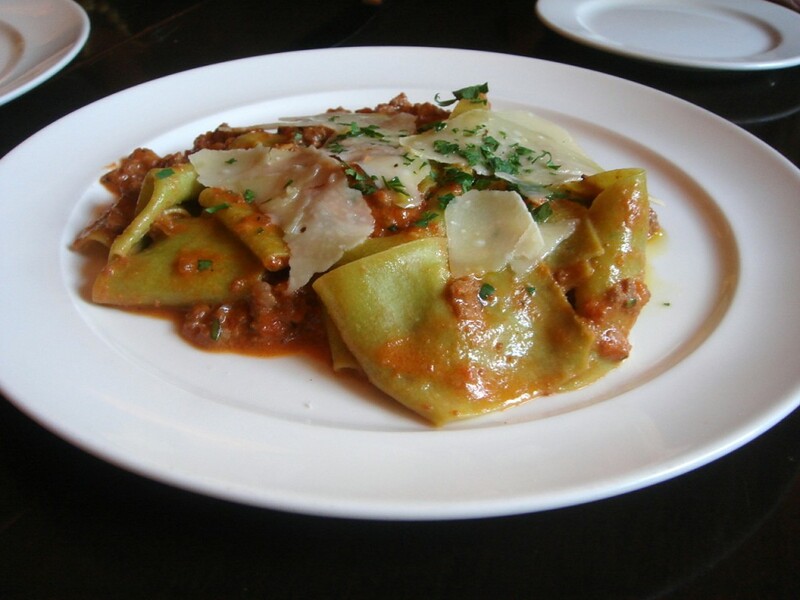 Spicy wild boar bolognese with arugula pappardelle ($18.50) was outstanding. The pasta was of the highest order. It was light and airy, and as good as the ones that you might find in the best trattorias in Italy. The wild boar bolognese, which permeated with flavour, was accentuated by the use of some aromatic rosemary, chilli flakes and shaved parmesan. This was a stunning dish. To finish, we decided to try the maple bacon ice cream ($6) which was truly unappetising. I am a big fan of the bacon and egg ice cream at The Fat Duck and I generally don’t have any issues with unusual combinations, least of all bacon tasting ice creams. But this was horrid. 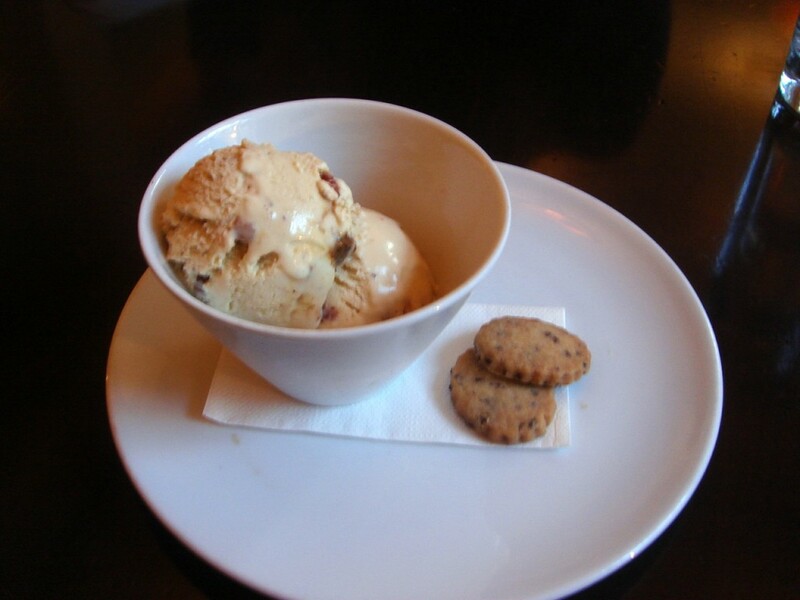 Small pieces of bacon had been rendered down and incorporated into the maple syrup flavoured ice cream. The latter, on its own, was fine. But the bacon, being cold, albeit not frozen, tasted sickly, and even sicklier when eaten with the ice cream. I enjoy hot, crispy bacon with maple syrup on pancakes, but this was an experiment gone wrong. Service was informed and attentive. The waiting staff were very knowledgeable about the food. There is definitely some great skill in the cooking at Restaurant Zoe. One needs to look no further than the sublime bolognese and the wonderful beef tongue to see evidence of this. In fact, it was obvious even in the less successful dishes. But what didn’t always work was balance of sweet and savoury in some of the dishes. And the dessert was an absolute disaster. But on balance, I think Restaurant Zoe is a really good choice for dinner in Seattle. You just need to make sure you choose carefully. About $35 for a small plate, main course and dessert. Excludes drinks, tax and service. Just the asparagus soup for me, please! Bacon and ice cream just do NOT go well together. Seattle is such a great city – for $35 for all that food sounds very good, even if the dessert was a huge miss. I love Seattle. Did you try the doughnuts in Pike’s Place? They are legendary. I definitely agree with you on the needing a kitchen while staying there. If the weather is good, you can always look for a nice park with a bbq. Thanks for sharing with us…….!!!! !